The request to bid on these units was sent to 135 manufacturers. Because of the stringent requests in the specifications, only The American Bantam Car Company (Butler PA) and Willys-Overland Motors (Toledo OH) responded. Specifically, the two items that were of most concern were the weight of the vehicle and time to deliver it. Detroit was building vehicles that were at least twice the weight of this vehicle, and most felt it was not possible to achieve the weight requirement of this spec. The American Bantam Car Company agreed to move forward, but Willys-Overland requested a granted time extension of 120 days to deliver the prototype. The Bantam Company was running with a limited staff, and did not have a design engineer. Therefore, they contracted Karl Probst to do the work on spec, which meant he wasn't getting paid unless their design was accepted. He designed and quoted the vehicle over the weekend. Within 5 days of picking up his pencil, Karl submitted the bid complete with blueprints and received the Army's approval to move forward. Various members of the military were concerned over Bantam's ability to meet the production needs and convinced Ford to participate in the bid. The Army then turned over the Bantam design specs to both Willys-Overland and Ford to speed their ability to get prototypes complete. It was the Army's opinion that they owned the rights to this vehicle, and they could share the initial design they approved. Bantam built their vehicle, known as "Blitz Buggy", using off the shelf parts with the exception of the 42hp engine, which was purchased from Continental Motors. On Sept 23, 1940, Karl Probst & Harold Christ completed the 230 mile journey from Butler, Pennsylvania to Camp Holabird, Maryland delivering the pilot vehicle within 30 minutes of the 49 day deadline. The Army was very pleased with it, but it was 1850lbs (500lbs too heavy.) The original weight of 1350lbs specified was based on the ability of four men to lift the vehicle out of a ditch. Therefore, the army picked a stronger soldier to validate that 1850lbs was acceptable. Meanwhile, Willys and Ford with the specs in hand had time to inspect the Bantam vehicle in action at Camp Holabird. Barney Roos, Willys' Chief Engineer, focused on designing the vehicle to be able to use their heavy production "Go Devil" engine, which had more power and torque than the Blitz Buggy. This vehicle was known as the Willys Quad, but it came in at 2100lbs. Therefore, they had to shave the difference out of it. It has been said that they specified one coat of paint to get the vehicle under the specification by 7oz. On November 13, 1940, the Quad prototype was submitted to the Army for testing. Most of the work was done by the time Ford began building their vehicle. They only had to build an alternative based on the first two submissions knowing the Army had seen and approved them. Ford's entry was originally known as the GPW, but it became known as the GP. Through an agreement with Willys, the GP used the "Go Devil" engine in lieu of their farm series tractor engine. Each of the three manufacturers was awarded to build 1500 LRV units to be used for further testing. Willys built the MA model, which stands for "Military" model "A". Ultimately, this was the vehicle of choice for many reasons, but the engine was the key differentiator. After all was compared, the Army took elements from each unit to design the MB production units for WWII. Over 640,000 MBs were produced between the 368,000+ Willys-Overland MB version and 277,000+ Ford GP versions that were licensed though Willys-Overland. As war was ending, Willys-Overland began to produce the CJ-2A in 1945 as replacement for small tractors in the civilian market. This was the birth of the Civilian Jeep (CJ) series of off road vehicles. 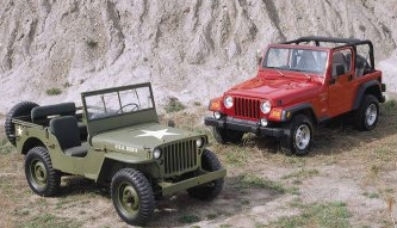 For 41 years, the CJ evolved from that basic CJ-2A to the final CJ7 in 1986. In 1987, the Wrangler (YJ) was first produced to be used more on-road than off. The YJ series is easy to spot, because their headlights are rectangular. This headlight change was never popular among Jeep enthusiasts. The YJ was produced from 1987 through 1995. The 1997 Wrangler (TJ) was released in the spring of 1996. It marked the return of the classic round headlights last seen on the CJ7, a change to a coil-spring suspension based on the Grand Cherokee, and the use of the Cherokee/Grand Cherokee's 4.0 straight six engine. In 2006, the 2007 JK was introduced in two and four door versions. The wheelbase managed to stretch to 95.4" for the Wrangler Unlimited 4 door. The Jeep continues today with the its distinctive styling, but has become more luxurious with multiple trim levels. It is "The Unstoppable Soldier" in more ways than one. In fact, there is a movie on DVD with that title. "Jeep CJ &; Wrangler - An American cult classic 4x4 for 70 years and running"
DVD through Amazon - "The Unstoppable Soldier"